Kia’s new luxury cruiser is better in every way, but still doesn’t stir excitement. The 2019 Kia K900 is sort of an oddball in the automaker’s lineup. The Korean brand is best known for high value, affordable, and well-built daily drivers, and here’s this behemoth of a luxury car with a starting price nearly double its closest next of kin. What gives? If you look a little deeper, though, then you’ll recognize that the K900 is actually a perfect expression of Kia’s ethos. Only here it’s applied to an unexpected vehicle segment: luxury cars. At this end of the spectrum the prices are higher, but Kia’s reputation for offering more car for less money still applies. Redesigned for 2019, the latest K900 enters its second-generation improved in every way. It now rides on a platform closely related to the brand’s sporty Stinger sedan (they’re built in the same Korean factory). The K900 is significantly larger and only comes with all-wheel drive, but it’s powered by the same twin-turbo V6 that motivates the Stinger in its most powerful form. That sounds like a recipe for success, and the K900 has vastly increased its palatability over its predecessor. That said, it carries over some flaws and isn’t quite the Stinger-inspired luxury car you might expect. 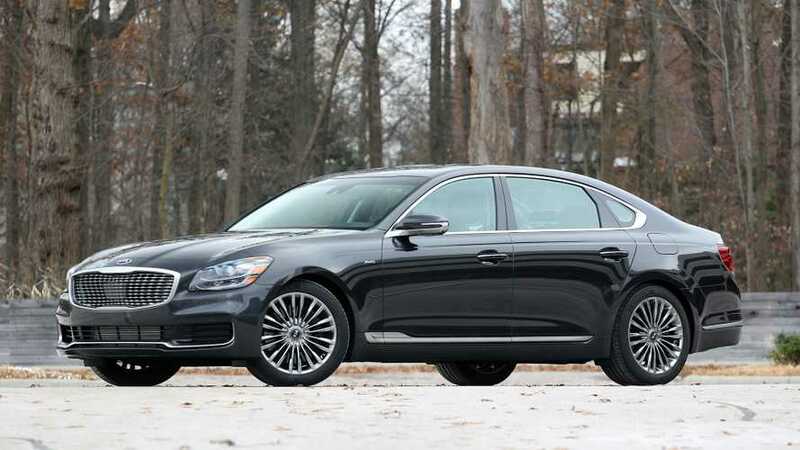 At $59,900, the new K900’s starting price is higher than most of its direct competitors, which includes the Lincoln Continental ($46,145), Cadillac CT6 ($46,995), and Volvo S90 ($48,100). That said, the K900 has no trim levels and only one option package. Thus, a fully loaded K900 with the single VIP package ($4,000) comes to an as-tested price of $64,895. Load up its competitors until there are no more boxes to be checked and, despite their lower starting prices, you’ll find most end up costing more than $70,000. The only vehicle in this segment that has a higher base price than the K900 is its corporate cousin, the Genesis G90. Its price starts even higher than the K900’s at $68,350. The sole option available is an upgraded V8 engine, which brings its fully loaded cost to a still-very-reasonable $74,000. The prior-generation K900 was as bland to look at as a piece of bread. The new K900 is a little better, and is more akin to looking at a muffin (a blueberry muffin, not something exciting like a banana nut muffin). Kia designers didn’t take many risks with the K900, and the result is something that’s not offensive, memorable, or even recognizable at a glance as belonging to the Kia brand. The design does, however, comport itself well to the duties of a full-size sedan. The greenhouse is large and the cabin shape offers plenty of width and headroom throughout. The caboose, too, is extra large and makes room for exceptional cargo space. The K900’s interior is mellow, understated, and comfortable. There’s a nice mixture of real metal, wood, and leather covering every surface, and the dashboard design emphasizes the interior’s generous width. There’s no new ground broken here, but as a driveable domicile, the K900 is like a warm Scandinavian lodge. Comfort really is this car’s middle name, with seats that adjust every which way (including the headrests) and enough cushioning to cancel out, or at least dull, the harshest of bumps. The rear passenger-side seat is also a lounge chair with 14 ways of adjustability and a 4-way power lumbar support. There’s a button that automatically moves the front passenger seat all the way forward. The same button also can tilt the front chair’s backrest forward. The combination gives the VIP in the back significantly more room to stretch out. This is more of a parlor trick than a useful feature, but it never fails to draw comments from friends when showing it off. There’s plenty of knee-, head-, and elbow-room for everyone who rides in a K900. And the trunk measures a gargantuan 15.3 cubic feet in volume – plenty of space for multiple golf bags, if not a whole golf cart. Kia uses a well-regarded infotainment system called UVO, and it’s never been shown off better than in the K900’s luxurious and ample interior. Employing a massive 12.3-inch horizontal touchscreen that can show up to three areas of the system at once, this UVO system goes about its job with not much flash, but high levels of competency. That may sound like a slight, but it’s not; too often luxury automakers stray from what works in their attempts to outdo each other. That wasn’t needed here, and Kia was well-served by simply dressing up its UVO system that’s already earned high praise. Unfortunately, Kia didn’t try to surprise and delight customers anywhere else in the K900. Whereas many competitors offer high-tech features that set them apart from the crowd, the K900 delivers what’s expected and nothing more. That said, it is the first vehicle I’ve reviewed that offers two wireless charging pads – one each for front- and rear-seat passengers. So that’s something. Kia only offers a single engine for the K900: the same twin-turbocharged 3.3-liter V6 used in the brand’s Stinger GT sports sedan. Here it produces 365 horsepower and 376 pound-feet of torque, which is sent through an eight-speed automatic transmission to the car’s standard all-wheel-drive system. That horsepower rating is on the low end for this class of entry-level full-size luxury sedans. For instance, while the standard Lincoln Continental comes with a 335-hp V6, buyers can opt for a twin-turbo V6 producing 400 hp. Likewise, a Cadillac CT6 can be had with a twin-turbo V6 that also makes over 400 hp. The Genesis G90, meanwhile, offers a stout 5.0-liter V8 producing 420 hp. Those are all numbers on paper, though. The K900’s engine is plenty powerful in the real world, and it’s capable of moving this luxo-barge at extra-legal speeds in a heartbeat. Credit goes to the eight-speed auto, which shifts imperceptibly and is always on the move for the right gear when you need it. There are multiple drives modes from which to choose that include Comfort, Eco, Sport, Custom, and Smart. The Sport mode livens up the K900’s throttle response, steering, and suspension, but isn’t a mode well suited to use all the time. Comfort mode is best for full-time use; it gives the car a relaxed demeanor that matches what most people expect when they drive the K900. Kia draws a dotted line directly from the K900 to the Stinger because they share a similar platform, an engine, and other mechanical bits. But the K900 is not a larger, more luxurious Stinger. The same care, effort, and attention to detail that makes the Stinger such a dynamic force hasn’t been applied to the K900’s handling. When in Sport mode, the flagship sedan drives quicker and stiffer, but doesn’t feel purposefully tuned or dialed-in. As a comfortable luxury cruiser, though, the K900 excels. In terms of safety, the K900 is at the top of the class because it includes every active and passive safety feature available as standard equipment. It’s all there: blind-spot monitoring, rear-cross-traffic alert, driver-attention warning, forward collision warning with pedestrian detection, lane-departure warning with lane-keep assist, adaptive cruise control with stop-and-go, a top-down surround-view monitor, and more. There’s really nothing more we could ask for because Kia includes just about everything. Despite using a smaller V6 engine, the K900 returns V8-like fuel economy. The Environmental Protection Agency officially rates the K900 at 18 miles per gallon in the city, 25 on the highway, and 21 combined. Those numbers either just meet or fall below the 400-plus horsepower engines offered by Lincoln and Cadillac. Also, premium fuel is recommended, though not required.